May 17th – AP test day and a new slow cooker recipe – Trees & Flowers & Birds! Amber knows where her food is and she’s keeping a sharp eye on it Just In Case! One of the new routines thanks to Chip’s bladder issues is that instead of leaving dry food out for them all day, I fill their bowls twice a day. This is not a big deal for Chip, but for Amber it is utter hell. I tried to ease her into it while Chip was at the vet, but she’s still in protest mode over the whole indignity of it. One of the OTHER things I need to do is keep their food seperated because I really don’t want Chip eating hers. And heck, I would ditch hers but that’s a large container of not inexpensive Royal Canan cat food and there is no way I am throwing all that $$ out! So, I moved her food bowl around the corner and away from Chip’s eyes and smell. I put his food down in the old spot and as he chows down I move over to the dining area and scoop some food for Amber. 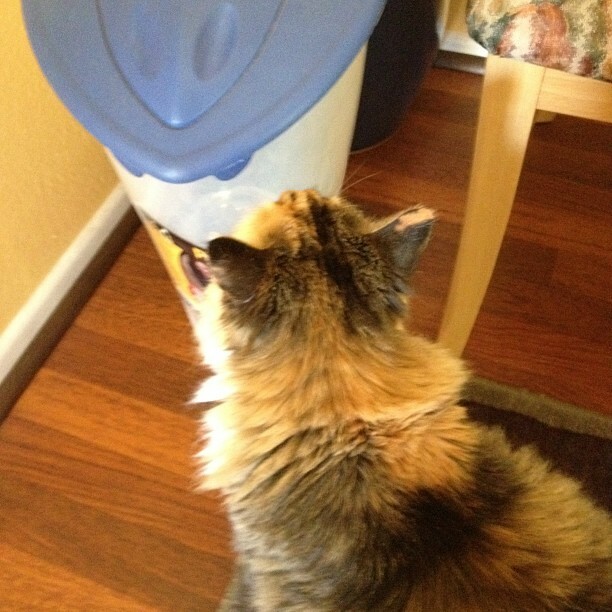 When she’s done, I wash her bowl and put it back in the container. It took her a grand total of ONE day to figure it all out. When she is hungry – that is what she does. Plops herself down in front of the container an stairs hopefully at the top, just sure that the power of her kitty cat sad eyes will cause the container to gush out food for her poor starving self. Pathetic. Anyhow, while I am happy with the eating arrangements and Chip is eating more wet food I now see that he is not drinking as much as he used to. So, a water fountain will be purchased this weekend and maybe some clam juice to flavor that water for him. He’s fine. Much calmer and not vocalizing as much and (thankfully) not peeing on the floor voluntarily or not and also NOT fussing with his hind end (sorry). 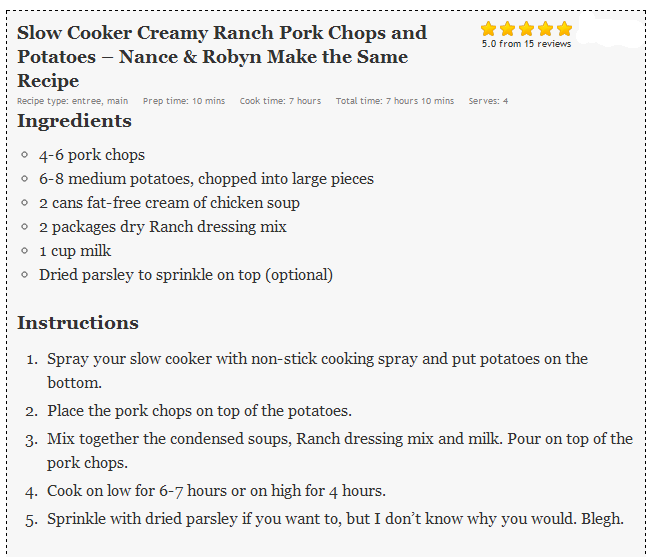 I don’t have their handy dandy plug in to display recipes, so I took a screen shot – You really need to click on that link and read their post. They are so damn funny! I cooked it on high since I was home and could start it later. I have to wonder if cooking it on low would have been better? One pork chop was tender and fell apart fabulously, the other one was tough and seemed overcooked. Same uneven results with the potatoes. It’s a pretty new cooker not used all that much and the last time it cooked perfectly but we almost always use low vs high. 15 cleaned his plate (I gave him the the tender chop) and I came to the conclusion that I just don’t like pork chops. I know – as much as I love bacon I am just not terribly thrilled with any other parts other than a truly perfectly cooked tenderloin. I’m not a huge fan of the pork roast or chop. Sigh…..the sauce was damn good and the well cooked potatoes were quite yummy. Back at some more technical writing. Oh hey – a little it of what I do has risen all the up to the Wall Street Journal this week. They wrote about the recent Google search update that knocked a bunch of folks off their results pages. Ours was one of those 😦 Our traffic has tanked since April 24th. And it was at an all time high plus ebooks were selling steadily until then. I find it funny that Google names their algorithm adjustments after animals. I keep saying that I am a “sad panda about Google Penguin” Heh. Because, you know, we survived the Panda updates but couldn’t get past that damn Penguin!! Anyway, I know, your eyes just glossed over if they didn’t already from the never ending cat/bladder talk. Sorry – documenting this for historical purposes and all that. May 16th – Beware of the cookies!